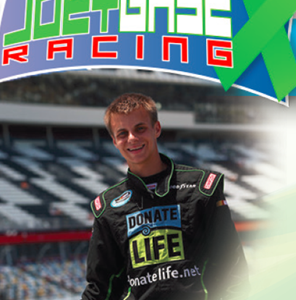 The Donate Life Texas organ, eye and tissue donor registry is proud to announce its partnership with professional driver, Joey Gase, for the November NASCAR race weekend at Texas Motor Speedway (TMS). Even with his 2015 top-5 Xfinity race finish at Talladega, Gase is more than just an up-and-coming NASCAR name. Gase races for a cause that is very close to his heart – to promote organ, eye and tissue donation. Gase was only 18 when his mother, Mary Jo, died of a brain aneurysm in 2011, and he gave consent to donate her organs and tissues. He races in her honor and is now as passionate about promoting organ, eye and tissue donation as he is about racing. Gase’s schedule for the NASCAR Xfinity O’Reilly Auto Parts Challenge and the NASCAR Sprint Cup AAA Texas 500 race weekend includes several activities designed to inspire fans to join the Donate Life Texas donor registry. He will also have an appearance at the new Driver License MegaCenter in South Dallas to thank Texas Department of Public Safety staff for the critical role they play in donor registration through the driver license and ID application processes. Donate Life Texas will also host a donor registration drive throughout the race weekend at TMS and Gase will drop in to sign autographs and thank those signing up in person. The registration drive will be staffed by Donate Life Texas volunteers, many of whom are transplant recipients or donor family members, like Gase. TMS will support the registration drive by encouraging its more than 2,000 employees to sport green Donate Life wristbands throughout the event.